In the early 60’s, the owners of a local garage received a postcard announcing the production of a new four-wheel drive vehicle. At the time, the automotive industry was producing only one other vehicle in this category, so the owners thought this might be a good opportunity to introduce a new four-wheel drive vehicle that they would be able to sell as well as service. The postcard was answered and the response was the founding of the first Toyota dealership in New England and the beginning of what has become a very successful endeavor for Dominic Galardi, Anthony Buglione and A-1 Toyota.The history of A-1 Service began before this. In January of 1951, Dom joined his father-in-law, Tony Buglione, in a partnership that included a gas station and used cars. The station was located on the corner of Olive Street and St. John in New Haven. In the late 1950’s, a new highway system was breaking through the neighborhood, people started moving to the suburbs, and with the limited space they had already outgrown, A1 looked for a new location.The new site they chose was in East Haven. The partnership grew to include Dominic’s brother, Andrew. Their new location, occupying a city block on Main Street and the sign reading A-1 Auto Service, Inc., became a landmark for many. In 1963, A-1 completed the building of the first Toyota showroom on the East Coast. 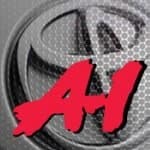 In 1966, just three years after opening their dealership, A-1 became the second largest Toyota dealership in the country. Toyota’s line-up featured only two vehicles at the time, the four-wheel drive Land Cruiser and one of the first economy cars, the Tiara. Over the years, A-1 Toyota continued to grow and in 1980 moved to their current location on Amity Road in New Haven, adding the Dodge franchise that dueled with Toyota until 1990.A-1 Toyota’s line-up looks far different than it did in 1963, but the basis for a successful business has continued. The business is still owned by the same family, and Dominic has been joined by his son, Tony, and daughter, AnnaLynn; Tony Buglione’s children, Mike and Carol, as well as Stephen and Dawn Wheeler, AnnaLynn’s husband and sister-in-law, who are there on a daily basis, and the next (3rd) generation of children, Stephen Wheeler, Jr., Tony Galardi, Jr. and Daniel Wheeler. A-1 Toyota is proud to be the 5th oldest Toyota dealership in the country. The commitment to quality and service continues today, and the A-1 Toyota showroom still features four-wheel drive vehicles, along with economy cars, but the line-up has grown to include family cars, vans, sporty 2-doors, pick-up trucks, as well as commercial vehicles. In looking back over the years, Dom Galardi is happy to have answered that postcard, and is proud of his family’s history with Toyota. With that in mind, the Galardi/Buglione/Wheeler family invites you to become part of their business family, where years of Toyota sales and service is still being celebrated.